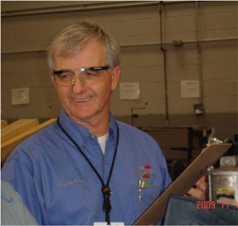 Charles Voss (Charlie) has a background of 32 years in manufacturing and over 14 years consulting. Charlie worked for Arvin Industries (now Arvin Meritor) for 32 years in various positions. During his career with Arvin, Charlie spent 9 months with TSSC (Toyota Supplier Support Center) to gain an understanding of TPS (Toyota Production System). Upon returning Charlie guided the development of Arvin’s Total Quality Production System and the Arvin Technical Support Center. Charlie joined a start up consulting group, YOMO Consulting as Senior Consultant. YOMO’s start up client was Alcoa. Charlie worked in more than 30 locations for the Alcoa start up, including the Alcoa acquired Reynolds locations.